Some think that Ruche' got its name from a tiny church dedicated to Saint Roch/Rocco near Castagnole Monferrato.Others believe that this vine roots were brought in from Burgundy during XII century by some French friars who then, planted them there. Some other people theorize that the name of this vine and wine comes from the local dialect "ruche'" which describes the area where this vine grows: on the top of the hills to get all the possible light of the Sun. 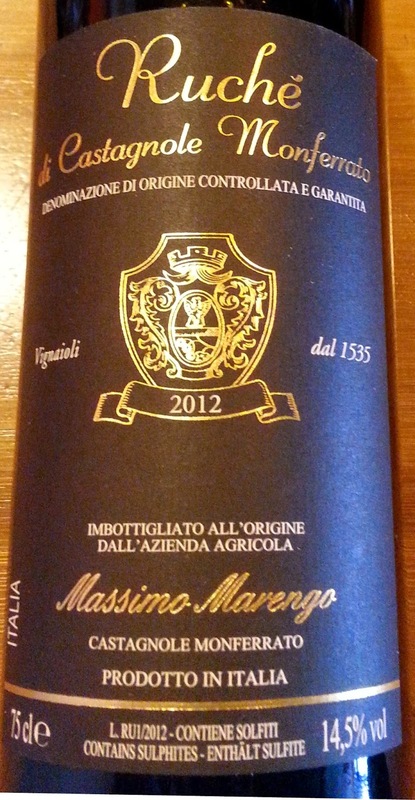 This is indeed a special wine that can't really be compared to any other wine in the whole world. - Ruche' grapes must make up to 90% of its blend leaving the remaining 10% of Barbera or Brachetto. 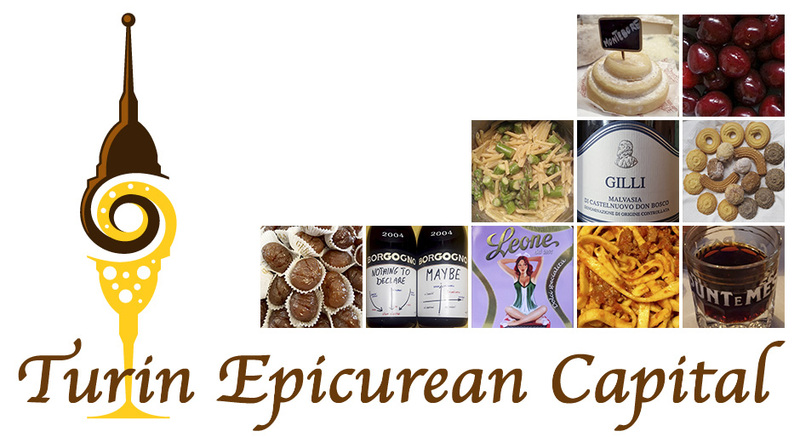 Like many wines in Piedmont, Ruche' is celebrated every year with its own festival. 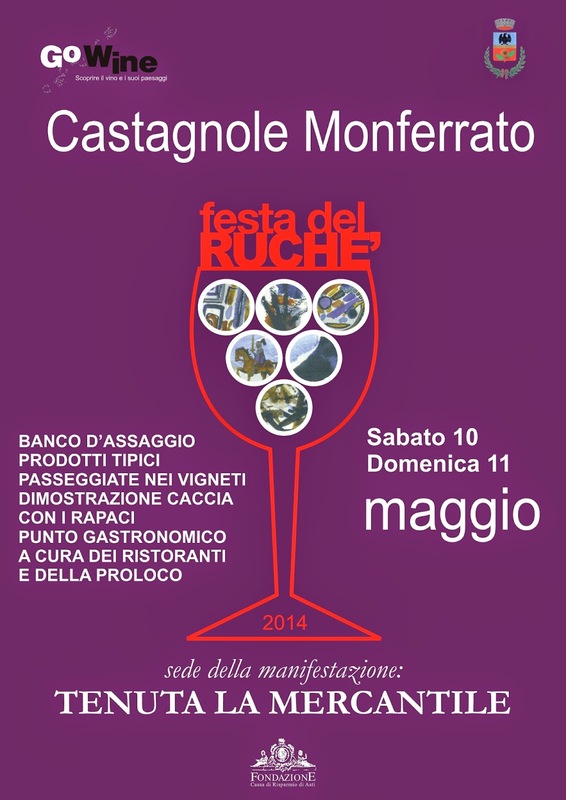 In 2014 it was in Castagnole Monferrato in early May, so mark it down for next year! 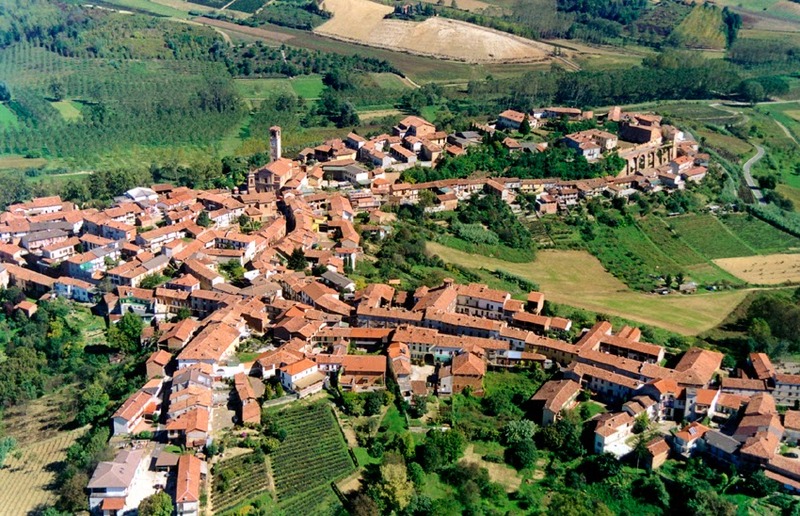 Castagnole Monferrato is a Medieval town in a hilly area, through its name: Castagnole, we can tell there used to be a chestnut wood (chestnut: castagna). 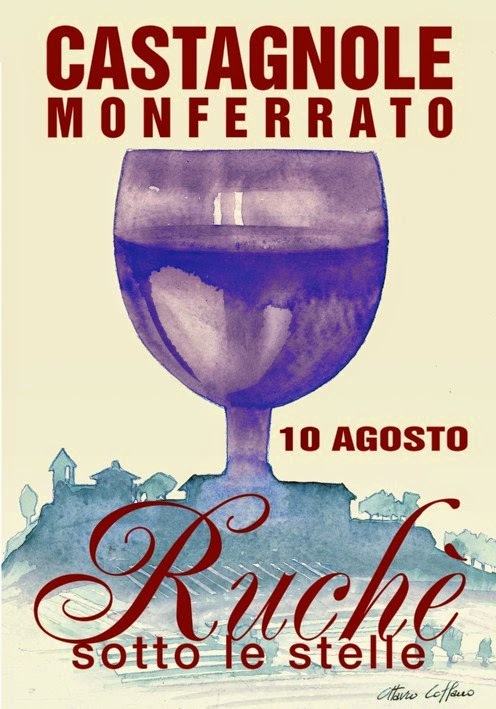 This coming August 10 there will be another Ruche' festival "Under the Stars", so if you are in the area get ready to delve in the local atmosphere with some wine tasting, local specialties, a visit to the Ruche' museum, a concert and historical costumes! The official Ruche' festival lasts 2 days and visitors have the change to taste the wines made in the 7 communes of the Ruche' DOCG area. 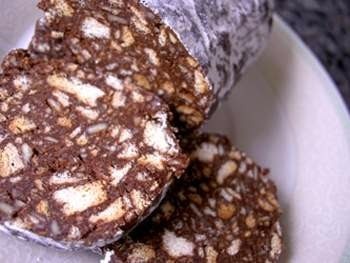 they can also savor the local specialties in a happy atmosphere with music and historical costumes. Because this is a medieval area, this year a simulated bird of prey hunt was also organized with eagles, goshawks, eagle owls and falcons. Piedmontese style tartare of raw veal, green fritters (vegetarian), chocolate salami, strawberries with dark chocolate, handmade grissini/breadsticks, hazelnut cake, many local cheeses, typical meat filled agnolotti with roast gravy, ruche' jellies served on top of Monale robiola cheese, acacia blossom jellies on top of locally made fresh goat cheese, honeydew honey on cow's milk half matured toma cheese, finocchini cookies (fennel seed biscotti-like cookies). Finocchini cookies are a PAT product whose traditional preparation technique is certified and whose original recipe is kept secret by the major company that makes them! They are typical of the Ruche' area and are considered very healthy due to the digestive properties of the fennel seeds they contain. They look like squared biscottis but are crumbly. They were a favorite of the local aristocrats who bought the personally! Agnolotti al Ruche' were a real surprise I had the chance to try last night. 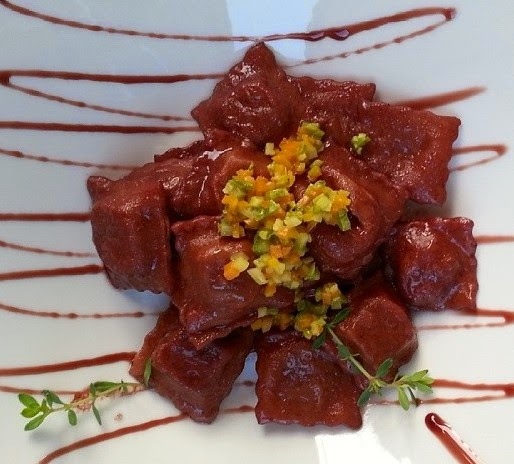 At first, I thought I had ordered regular agnolotti with a Ruche' reduction sauce. Little could I imagine that the restaurant chef add actually added Ruche' to the eggs and flour mix of the pasta sheets. And boy, you can only imagine the Ruche' scent reaching my nose when the waiter served me. Fantastico !!! sicuramente ci saro in quella data in Monferrato Che bello, grazie ! !